In a world of ever-changing algorithms and saturation, how does one stand out from the rest? Do you need better filters? Or a better camera? The answer is surprisingly, NO! Instagram Stories is one of the most underrated features when it comes to standing out from the crowd, and in this post, we’ll be sharing some of our favorite Instagram Stories tips to help you up your social media game. Since Sidewalker Daily works with travel brands on their influencer marketing initiatives, we’re always doing our best to stay on top of market trends, and we’ve noticed that Instagram Stories are way more than meets the eye. It’s basically like LIVE TV and can definitely help create a serious relationship with your audience. Not to mention, it’s an additional way to monetize your Instagram account…which is everyone’s goal, right?! So we’ve teamed up with travel influencer (and Stories wizard), Klaudia from The Travel Critic, to give you some insider Instagram Stories tips to help you take your Stories game to the next level. From the best apps, to engaging videos, she’s diving into all the latest tips and tricks in the Insta Story world. Influencer Instagram Stories: How To Use Them + Why By Klaudia, The Travel Critic. First things first, why are Instagram Stories so important for your brand? Let’s get straight to the facts. There are now more eyeballs on Instagram Stories than on Snapchat, which makes it very clear that Instagram isn’t going anywhere any time soon. Currently, Instagram Stories has over 400+ million users per day. With such staggering numbers, it’s no wonder why influencers are able to monetize their Stories (with swipe up links etc). Instagram Stories is the perfect outlet for true digital storytelling. Also, using Stories in the right way is one of my favorite tips to massively increase Instagram engagement. By curating exciting video/photography, you can create captivating Stories that will keep your audience engaged and impressed. If you’re the type that isn’t comfortable on camera – do not worry! This is totally natural. Once you do it a few times, and start getting the hang of it, you’ll be a pro. In fact, that is exactly why followers enjoy watching Instagram Stories, because it’s more natural and they feel like they can better connect with you. Being your authentic self is the name of the game. Perfectly curated posts are the standard, but your personality is what will keep you unique on the platform. But let’s say you’re already comfortable being in front of the camera and now you’re wondering “how can I take my Stories to the next level?” Stay tuned for that because I’m covering tons of creative ways to stand out below. When pitching to work with other brands, Instagram Stories is also a great asset! For one, if you have high engagement on your Stories, you can combine it in your deliverable set. I know influencers who promote tons of sponsored content just on Stories, but not on their permanent posts. The more you use Stories, the more you build your loyal following and can then capitalize on this engagement on paid partnerships. And if you’re a content creator working with brands, then Stories are also a way for you to add value to your client, in addition to the content you are creating for them! Unfold App – This is my latest obsession! Why? Because it’s so simple and clean! What is awesome is that you can have a still photograph in the Instagram Story background, while having a video on top of it, which makes for a very unique experience. Or you can add two photos on one story as shown below. Hype Type App – Have you ever wondered how users have animated fonts on their Stories? Yeah me too, and then I discovered Hype Type! It literally makes your font so hype. You can easily animate text over photos and video. The app is perfect if you want to introduce your audience to a blog post or certain destination you’re traveling to. Sparkpost App– This app is life. It has so many prepopulated themes that can help you create artsy Stories for any occasion. For instance, they have templates for foodies, lifestyle, travel and so much more. Also, you have the ability to customize the font, colors or arrange the story to your liking. This app does not limit you just to Instagram alone – you can create Facebook banners or Pinterest pins with the correct dimensions in place. Sparkpost has more options than Unfold, but both are equally good in creating aesthetically pleasing content – the possibilities are endless. Huji App – If you’ve ever wondered how to get a retro look to your Insta Stories, let’s say, circa ’98, well, welcome to the HUJI app! This ‘disposable’ camera will take photos and turn them into disposable camera finishes. You can upload them to your Stories to give them an edgy look. Preview App – So once you’ve created gorgeous Instagram Stories, you may need help with planning and staying organized, which is why Preview App is perfect for laying out your Stories. You can easily see the cadence and re-arrange as you see fit. Plus, working in a ‘batch process’ will save you a lot of time in the future so this app can really be a time-saver. Efficiency is why the Preview App is one of my favorite Instagram Stories tips! So now that you know of all the best apps to create some exciting Story templates, you need to work on increasing engagement. For some, posting on Stories may come easy, but for others it can be a frustrating experience. If you’re one that often gets stuck, I would recommend building out a weekly editorial calendar, with Story ideas pre-planned, so you don’t have to try and think of them on the whim. 1. Ask Questions that Require Feedback: The best way to interact with your audience is to ASK questions on your Insta Stories. For instance, you can ask your followers “what’s your favorite carry-on bag”? Or, “what’s the best travel story you have?” From there, you can screenshot their answers and then post them on your Stories, which shows that you connect with your audience as well as giving them a little shout out to make them feel special. Also, this allows you to get to know your followers better and make genuine connections. After all, isn’t that what social media is all about? 2. Utilize the Poll Function: The poll function is a quick and easy way to have your followers interact with you. It basically gives your followers the autonomy to make a decision. Also, you can post the results of your poll so you can showcase the ‘official’ decision. 3. Go Live: I know what you’re thinking, but believe me, it’s NOT so bad. Going live gives your audience the most authentic experience because there is NOTHING curated about it. Don’t worry about ‘messing up’ or not saying the right thing, because that is what will keep you genuine. Your audience wants to feel as though they’re just like you – flaws and all. Rumor has it that Instagram favors Live Videos so it may essentially help you with exposure too. 4. Go Live With a Blogger: Another way to get creative with Lives is to invite a fellow blogger to do them with you! This is the perfect way to transition into Lives because you’re not doing them alone. Or, if you want to interview a fellow blogger about a special topic, it’s a great way to give your followers value and insights! This is one of my favorite Instagram Stories tips because not only are you providing engaging content for your followers but you’re building relationships with other people in the industry which is always a win! 5. Take Your Audience On a Journey: The good, bad and ugly. Don’t only show the highlights of your life, but reveal the things that people can relate to. For instance, missing your flight, or having lost bags – yes, it’s not fun but it’s all part of your journey, and it will keep your audience more enticed. Here’s a great example – a few months ago, I traveled to Costa Rica and lost my SD card with ALL MY CONTENT. It was by far the worse case scenario for a travel influencer. But guess what? I showcased the entire journey of losing my SD card, all the way through to finding it in a coffee plantation and having it mailed to me by the farmer who found it. The journey was real, captivating and it gave my audience insight into mishaps on my trip. Plus, I had a lot of DM’s from my followers who shared their sentiments with me. 6. GIFS: Using GIFs is a fun and simple way to keep your Stories entertaining. The more clever you can be, the more reactions you’ll receive from your audience. 7. Call to Action: One way to increase exposure to your posts is to create a call to action on your Stories. For instance, you can create a story that says “Check out my latest post” and it will drive your audience to see the latest photo you posted. Or, you can add a link to your latest blog post so they can easily swipe up to read your post. 8. Instagram Takeover: Instagram Takeovers are a great way to increase your visibility. For instance, if you can land a takeover for a huge travel account you will increase your exposure to more like-minded travelers. Additionally, you will most likely gain a lot more followers because you’re in the same niche. Also, you can ask a fellow traveler to take over your account as well, to bring new content to your page. Now you know some great apps to use and some ways to boost engagement on Insta Stories but there’s one more important piece of the puzzle I need to go over…CONSISTENCY. Yes, doing Stories here and there is better than nothing, but consistency will help you not only build an engaged audience but keep them around. Since through Stories people are super connected to you (and feel like they know you), then just like your close friends they’ll expect consistent updates. And if you’re able to build a dedicated Story audience then you’ll be able to include that valuable information in your media kit when pitching to brands which is a huge plus! Pro Tip: Post at least 3 stories a day to keep your engagement at an all time high! The ultimate guide to Instagram Stories wouldn’t be complete without some solid advice on how to stand out. 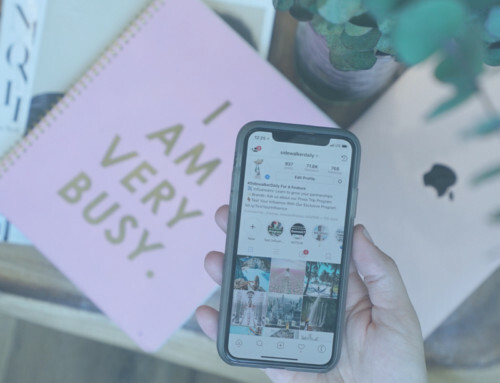 With Instagram’s latest ‘Question Feature’ many bloggers and influencers have simply stated, “Ask Me a Question,” which is fine, but why not make it about your audience? Try asking more questions like, “How can I help you?” Or, “What questions do you have for me?” That way, you can truly see where you can provide value. Additionally, you’re able to see what your audience is curious about and curate your content to meet their interests. And let’s be honest, when you are simply stating, “Ask me a question” and posting it on your Story, it comes off spammy and people will get sick of seeing the same type of content. By gathering more information about your followers, you can also identify what type of blog posts you can write about, to give your audience an even a deeper level of understanding on the topic. Another interesting feature to use is the ability to incorporate music into your Stories. You can add some upbeat tunes or new music finds to keep your posts entertaining! Influencers and bloggers are always looking for Instagram Stories ideas to get more followers and boost engagement which are two of the main things you should be communicating when pitching to brands. By incorporating these Instagram Stories tips and tricks, you can definitely start doing both as well as showcase your overall uniqueness! If you have any questions about Instagram Stories, feel free to comment below or reach out to @thetravelcritic – happy storytelling! Have any other Stories tips you’d like to share? We’d love to know! Feel free to share in the comments section down below!